Description For novice players (unrated or rated 1100 or less) who are not ready to play in the 2-3 day championship, try this 1-day side event. The super-low entry fee of just $15 (CASH only!) 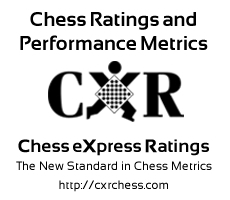 includes CXR ratings for all. Check in is 8:55 to 9:15 AM. There will be 5 rounds with a lunch break after round 3. Winner gets a Chess Clock! Directions Same location as the Arkansas State Championship ... PLEASE NOTE THE NEW VENUE AT KNIGHTS OF COLUMBUS HALL!